I love fresh guacamole and will put it on almost anything. Chips, tacos, salads, burgers, tortilla soup, they’re all fair game for a dollop of guacamole. Luckily, fresh guacamole is incredibly easy to make with a good blender. I’ve purposefully made this recipe to be a bit spicier, but you can adjust the recipe to your heat tolerance by adjusting the amount of jalapeno and chipotle pepper or completely leaving it out. Add all of the spices, salt, cilantro, jalapeno peppers, tomato, onion, and the juice of one lime to the blender container. Quickly pulse ingredients 5-10 times on a low speed setting (variable speed settings 2-3), using the tamper to push ingredients down into the blades while blending. Once the ingredients are chopped, add the avocados and pulse again 5-10 times on low speed, using the tamper to push ingredients down while the motor is running. When everything is thoroughly combined, scoop the finished guacamole from the container and serve with chips, use to top almost anything. 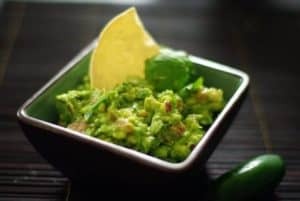 Storage tip: Place any remaining guacamole in an airtight container, packing it down to remove any air pockets. Squeeze a bit of fresh lime juice onto the top, cover with plastic wrap and secure lid. Store in the refrigerator for 2-3 days.